Belmont’s China study abroad program has a record of innovating new components for short-term study abroad, and the summer 2015 trip was no exception. A team a psychology majors, including Iris Chiang, Heather Dudley, Joseph Kenkel and Matthew Maloney, collected data for a psychology research project while at Zhengzhou University in Zhengzhou, China. The research team has been working with Department of Psychological Science Professor Dr. Pete Giordano on developing and validating questionnaires to measure two constructs. The Global Dominance Inventory assesses social dominance orientation and domineeringness, while The Traditional Gender Roles Inventory measures beliefs about traditional masculine and feminine gender roles. The team has worked together for a year and a half and has collected data for two semesters from Belmont study participants. 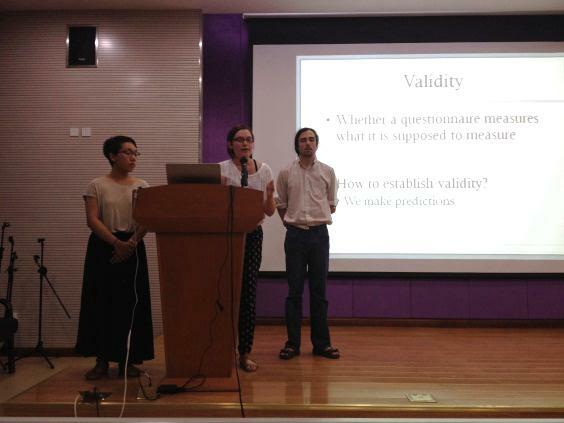 The chance to cross-culturally validate the questionnaires with a sample of Chinese students at Zhengzhou University was a unique and challenging opportunity. Students worked with Dr. Giordano, as well as Assistant Professor of Chinese and Asian Language Dr. Joan Li to translate the questionnaires into Chinese. Dr. Li coordinated with administrators in the School of Foreign Languages of Zhengzhou University to set up the research project on site. The students were able to collect data from 101 Zhengzhou University students, who completed eight questionnaires. The Belmont research team also gave a brief presentation to the students after they completed the questionnaires. The statistical analyses from this cross-cultural study thus far are very promising and provide further support for the validity and reliability of the questionnaires. The research project was funded in part by a Bass Asian Studies Research Grant.